Insight is an Apple Authorized Corporate Reseller for Mac, iPad, & iPod products and accessories as well as an Apple Authorized Government Reseller. From innovative iPad and iPod devices to powerful Mac notebooks and desktops, Insight and Apple offer the personal productivity solutions you need to transform your organization. Insight works with your team to customize your choice of services that meet your requirements and will exceed your expectations. Our Apple solutions can be provided individually or as part of a larger solution. Insight connects you to the Apple products and services that help your agencies run smarter. Insight has a robust State & Local account team to help support your Apple requirements. Please note that Education customers will not be eligible to procure Apple hardware through Insight. Please reach out to your Apple Education Representative. Apple cares deeply about security, both for the user and for protecting Government / Corporate data. We built advanced security into our products from the ground up to make them secure by design. And we've done this in a way that's in balance with a great user experience, allowing individuals the freedom to work. Only Apple can provide this comprehensive approach to security because we create products with integrated hardware, software, and services. Want to learn more? Download the iOS Security Whitepaper. The Apple Device Enrollment Program helps businesses and agencies easily deploy and configure iOS and OS X devices. The Device Enrollment Program provides a fast, streamlined way to deploy institutionally owned iPad and Mac units or devices that are purchased through Insight. The Device Enrollment Program simplifies the initial setup by automating mobile device management (MDM) enrollment and supervision of devices during setup, and enables customers to configure devices without touching them. More information on the Apple Deployment Programs is available through the Device Enrollment Program Guide. Mobile Device Management allows agencies to easily manage their iOS & Mac devices and keep devices up-to-date with the newest software and configurations. Insight partners with AirWatch, JAMF, and MobileIron to provide MDM solutions through the Device Enrollment Program to Apple devices. IT can create deployment workflows that scale to meet your agency's needs. Insight can also help agencies with their iPad Cellular activations through their partnerships with the carriers. Please reach out to your Insight representative to learn more about the Device Enrollment Program, Cellular Activations, and Device Management offerings. From innovative iPad & iPod devices to powerful Mac notebooks and desktops, Insight and Apple offer productivity solutions for State & Local agencies to transform your organization. Optimizing your Apple investment with a robust selection of Apple services - from application development and advanced integration to device management and asset disposal and trade-in - Insight can help deliver end-to-end solutions. Solutions range from paperless computing, electronic voter registration, to public safety offerings. Through our ecosystem of partners, there are numerous iOS applications that are being utilized by State & Local agencies today to transform their day-to-day processes and citizen engagement. Have Questions? We can help. To utilize Apple through the Insight Public Sector technology solutions contract, you must be registered as a participating agency with U.S. Communities. There is no cost for membership, no user fees or commitments. U.S. Communities is open to states, state agencies, counties, cities, schools, colleges and universities, non-profit organizations and special districts. If you are already registered, please contact Insight Public Sector. 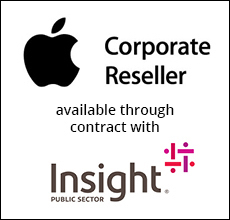 Apple products and services are competitively priced through the Insight Public Sector contract. Insight Public Sector's competitively-solicited U.S. Communities contract assures you of Insight’s best overall government pricing on our broad portfolio of products and IT service solutions. The U.S. Communities technology contract was awarded after the lead public agency, Fairfax County, Virginia, completed a competitive solicitation and thorough evaluation process and is available for nationwide use. Apple was named in the award under Insight Public Sector. For additional contract details, please see the Insight Public Sector contract.